Two things: a story on how I fell in love with baking and a simple recipe for delicious banana bread. I have a passionate sweet tooth. Ever since I was a little girl, my eyes would be filled with delight whenever my mom would bake pastries, bring home cakes, and try out new recipes. But the irony of it all was that I always enjoyed the product but never the process. I was the taste tester but my hands never found their way to a mixing bowl. It didn’t matter much to me because I had a mother who would lovingly do it for her children. Fast forward to a little over a decade later and the scene is this: The shiny, new oven arrived in our newlywed household and I stood in front of it, terrified. I did not know how to use it; I did not know how to do anything domesticated. I tried to stay away from it but as I passed the kitchen every morning, the oven was pleading to be used. There was nothing else to do but take the plunge. The first recipe I tried was banana bread. It looked fairly easy for a beginner like me and more importantly, it was chock-full of memories. 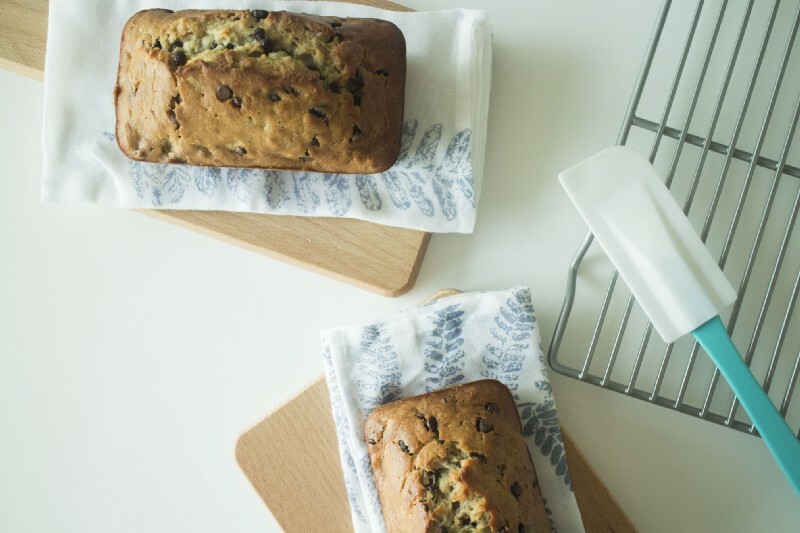 I remember the joy on our faces, especially mine, when my mom would announce that, “I’m baking banana bread today.” My heart would always skip a beat when those words were uttered. I don’t know if it’s the chocolate chips. The loaf shape. My mom baking. The beautiful, heavenly, delicious waft from the kitchen. Maybe it’s all of them, put together. I wanted to recreate that sweet experience for my husband and me. So I asked for the recipe and followed each and every step diligently. I crossed my fingers as I watched the mixture rise into a beautiful loaf. As it cooled down, I sliced into it, took a bite, and found myself falling in love. Not just with the insanely delicious banana bread but with baking. Eating is one thing but baking is another. There’s something about mixing all the ingredients together and then later seeing them rise into a pastry so sublime and nostalgic. It’s messy as first but oh, how that mess turns into mesmerizing magic! And that experience becomes even more beautiful when loved ones gather ‘round to enjoy the product of your hands. It’s what makes the challenges of baking worth it. Maybe that’s why my mom always baked for her family. The success and joy that came from baking this led me to try my hand on so much more… chocolate chip cookies, sour cream cheesecake, orange madeleines, salted caramel cupcakes, lemon soufflé, and floral buttercream vanilla cake. All it took was nostalgia and courage, a heart and a hand. The best part is I can pass on the simple joys of my childhood to my very own children. When I will watch them dig into that heavenly slice, life will have come full circle… thanks to my sweet tooth. The recipe is easy. Just bake it with love. 1. Combine 1/2 cup butter (softened) and 1 cup sugar until mixed well. 2. Add 2 eggs, 3 ripe medium-sized bananas (mashed), 1/2 cup milk and mix well. 3. In another bowl, mix 1 1/2 cups of flour, 1/2 tsp. baking soda, 1/4 tsp. baking powder, and 1/2 tsp. salt and then add in the butter mixture. 4. After mixing, pour in the chocolate chips (as much as you want). 5. Pour the batter evenly into 3 mini-loaf pans or 1 bigger pan. 6. Bake at 350 for about an hour.